Be the first to share your favorite memory, photo or story of Kyiandrea. This memorial page is dedicated for family, friends and future generations to celebrate the life of their loved one. 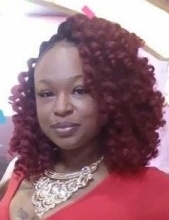 Kyiandrea Renee Terry, “Kei”, 38, of 831 State Street died March 23, 2019 at UNC Hospital Chapel Hill. She was born in Vance County to William Edward Sanders and Doris Valentine Jackson. A funeral Service will be held at 2 pm, Sunday, March 31, at Fresh Anointed Tabernacle. Interment will follow in Blacknall Cemetery. Survivors include her children, Quavon Champion, Isaiah Williams and Janiyah Williams; one granddaughter; parents, Doris Jackson (Delmar) and William Sanders; two brothers: Toney Sanders (Sharonda) and Delmar V. Jackson ( Lynette); three sisters: Dionne Chavis (Samuel), Charmal Milliner-Ross and Christy Johnson. The family is receiving friends at 334 Davis Street. Arrangements are Davis-Royster Funeral Service. To send flowers or a remembrance gift to the family of Kyiandrea Renee Terry, please visit our Tribute Store. "Email Address" would like to share the life celebration of Kyiandrea Renee Terry. Click on the "link" to go to share a favorite memory or leave a condolence message for the family.